I will always remember attending the Rice – Texas game at Rice Stadium on October 27th. Very somber crowd – at least to a 12-year old football fan. BTW, the game ended in a 14-14 tie. Brings back memories. 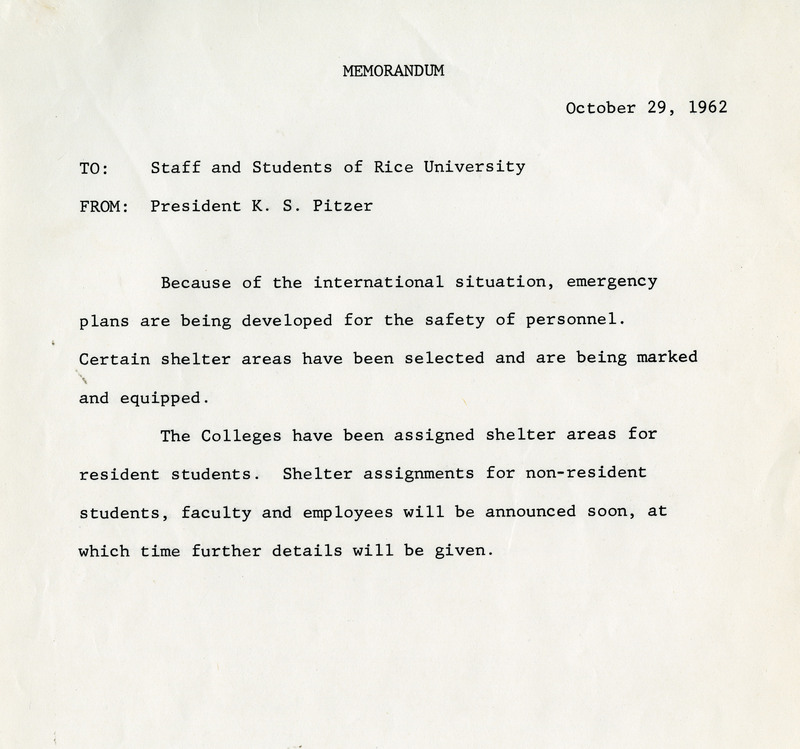 Almost every new house we looked at had bomb shelter. And someone older might want to confirm (I was almost 7 at the time). but it seems that the media liked to remind us that Cuba was less than 1000 miles from Houston. My strongest memory of that era was a picture of an anti-aircraft missile battery behind sandbags on the streets of Miami. Lots of people were very, very scared. I was 7 then. I remember vividly that it was the first time I realized that there were things in the world that scared my parents. I remember my dad trying to explain what was going on. I remember him showing me where Cuba was on the world map we had in the hallway, and explaining how far the missiles could travel. He did not try to sugarcoat it, but he did not go into a lot of detail either.